Books about food are rarely on my reading list, but I do love to cook and am always open to new recipes for our dinner table. This lovely memoir touched my heart and warmed my soul on a blustery Chicago day. When the author lost the high paying job she loved in 2008, she decided to unearth her grandmother’s recipes and the result is this book which is about so much more than food. It is about families facing hard times with determination and fortitude. I believe many people dealing with a stagnant economy, job cutbacks and layoffs will find comfort and hope in this book. I know I did. Special thanks to Cathie for the recommendation! 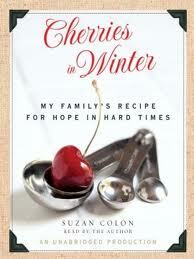 This entry was posted in Uncategorized and tagged Cherries in Winter: My Family's Recipe for Hope in Hard Times, food, New York, recession, Suzan Colón, Thanksgiving. Bookmark the permalink.